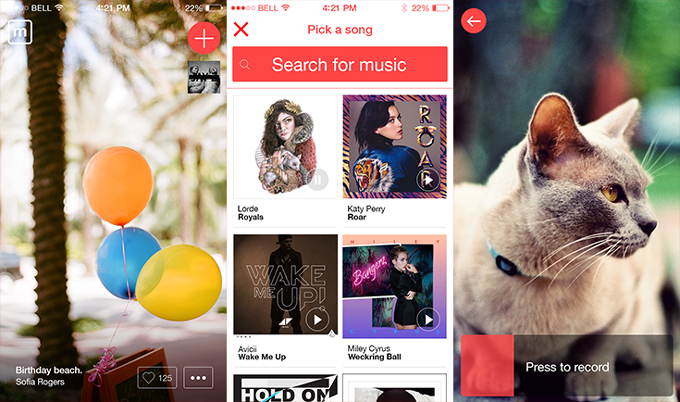 Meet Mindie, a beautifully designed video-sharing app for the iPhone. But calling it a video app is just one part of the story. It’s not yet another Vine, Instagram or even MixBit competitor. Mindie is all about music discovery. You pick a track, record a few seconds of video like you would do in Vine, and share the combination of the two on Twitter, Facebook and Mindie. “Music is a catalyst for creativity,” co-founder Grégoire Henrion told me in a phone interview. “It’s very complicated to shoot an interesting video, but if you put music on an awful video, it will make it interesting,” he continued. As he says, music is the story of your video, not the images. In other words, the video is the caption, not the music. While having no sound is disturbing at first, the experience is still very personal, because music is a great way to share emotions and a particular mood. The video is the caption, not the music. Music discovery apps are very hard. For example, Turntable had to shut down Piki, the company’s social music app. That’s why I was skeptical when I read what Mindie was all about. But when you open the app, you instantly get it. Just like in Frontback, the content takes the center stage. There is no chrome around the videos, you are putting yourself in your friends’ shoes. Videos last seven seconds, because Instagram showed the Mindie team that 15-second videos are too long. And of course, you hear a few seconds of the hand-picked soundtrack. When you swipe your finger across the screen, you get another video, another song. And it goes on and on. All of this is very smooth. Every time you watch a new video, it feels like discovering a brand new personal experience that someone wanted to share with you. You can like, share and buy the track on the iTunes Store. For now, Mindie doesn’t create another social graph. When you first create your account, you automatically follow all your Facebook and Twitter friends that already use the app. Creating a video is very easy. First, you search for the track that you want to select. Mindie uses the iTunes Store API to pull song previews. Then you shoot your video like in Vine or Instagram. Finally, you can add a caption and share it on Twitter or Facebook. When asked whether Mindie was a video-sharing app or a music discovery app, Henrion’s answer was straightforward: “Mindie is a music app. In the App Store, we are in the music category.” According to him, Vine is becoming an app to share comedy bits and is very different from Mindie. It is no longer the app to capture personal and fleeting moments. That’s why the company doesn’t even see Vine as a competitor.